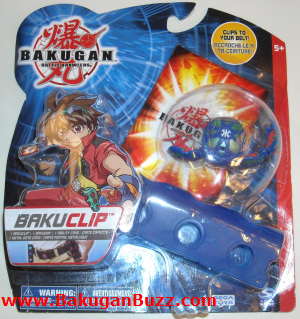 You need a way to carry your bakugan into battle and the Bakugan Bakubelt solves this problem. 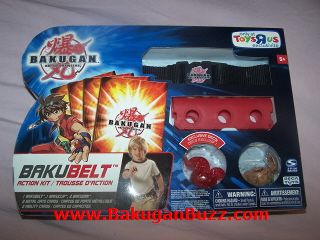 The bakubelt is a Toys r Us exclusive and comes with a nylon webbing belt, one red bakuclip and 2 original sized bakugan ( one is exclusive to this set, translucent pyrus dragonoid, the other is a subterra gorem ). 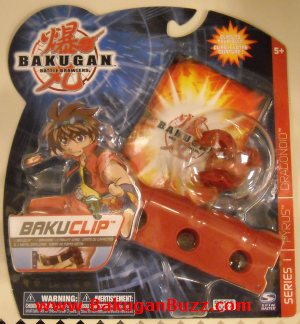 The bakuclips hold 3 bakugan and have a small clip so you can clip them onto a belt. 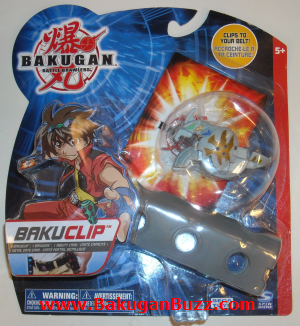 The Bakuclips packages come with one bakuclip, one bakugan and one gate card and one ability card. There are 6 different bakuclip packages, one for each attribute. 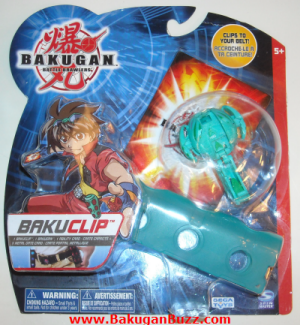 The color of the bakuclip matches the color of the bakugan ( attribute ). 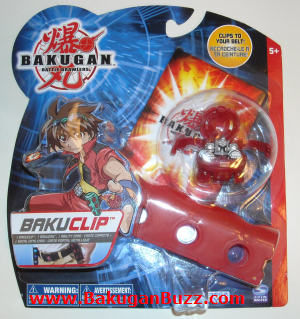 The pyrus ( red ) bakuclip comes with a dragonoid bakugan. 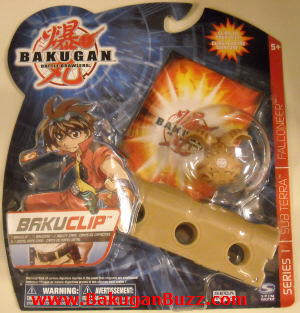 The subterra ( brown/tan ) bakuclip comes with a griffon bakugan. 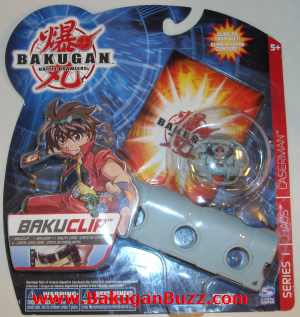 The haos ( gray ) bakuclip comes with a laserman bakugan. 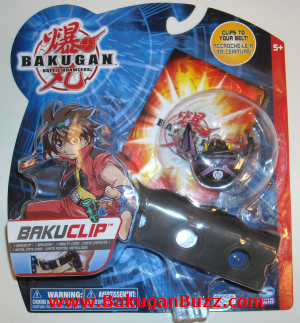 The darkus ( black ) bakuclip comes with a robotallion bakugan. 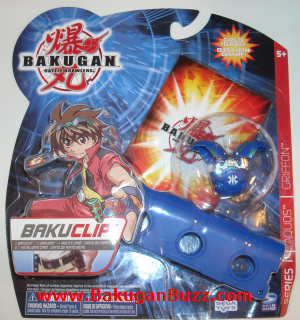 The aquos ( blue ) bakuclip comes with a falconeer bakugan. 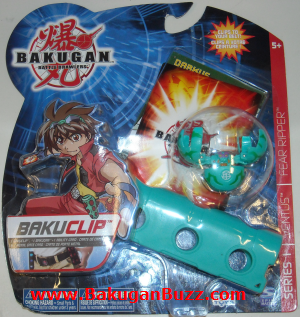 The ventus ( green ) bakuclip comes with a fear ripper bakugan. The bakuclip packages retail for $6.99. 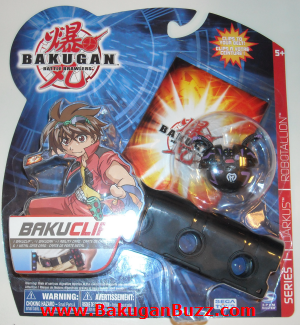 I have seen bakuclips that have come with different bakugan recently as well such as a darkus one with a dragonoid. NEW BAKUCLIPS There are new bakuclips that have just come out. 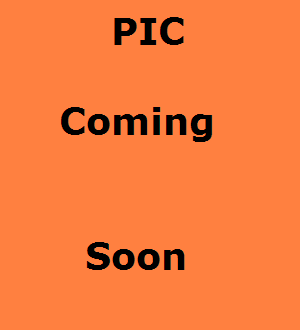 These include B2 size Bakugan ( the older ones included the smaller 29mm original size bakugan ) . All of the bakugan had a g-power of 580. Also these bakuclips are translucent!